MEMOFIN - Joint report on International Swap regulation - L'information financière que vous ne trouvez nulle part ailleurs ! The staff of the Commodity Futures Trading Commission (CFTC) and the Securities and Exchange Commission (SEC) must be commended on their outreach with other international regulatory bodies to harmonize the new rules and regulations over the swaps markets. I am confident that this level of coordination and cooperation has never been achieved previously. I respectfully dissent in the issuance of this Report. First, it fails to properly capture the entirety of the regulatory landscape. Second, it should acknowledge in greater detail the challenges in harmonizing our rules. 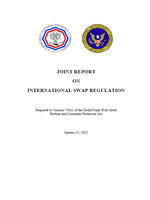 This Report provides a general, but incomplete, picture of the international rulemaking process. While it is accurate to say that there is international coordination on general policy considerations, significant questions remain regarding the extraterritorial application of the specific rulemakings currently underway at the Commissions. Further, significant questions remain regarding the pace of rulemakings among the various regulatory bodies going forward. As of the date of this Report, neither the CFTC nor the SEC has disclosed the extraterritorial application of our proposed or final rules. Under both the proposed and final rules it appears that U.S. rulemakings would apply to entities and activities in foreign jurisdictions. For example, the application of the proposed rule regarding the CFTC’s entity definitions would make U.S. financial and non-financial entities subject to mandatory clearing and capital requirements, even if they operate outside the U.S., while foreign competitors may not be so constrained. Until the Commissions specifically define the extraterritorial application of these rules we exacerbate the significant regulatory uncertainty for global market participants. We also delay progress towards mutual recognition or mutual accommodation, which are essential to avoiding duplicate or contradictory regulatory obligations for such market participants. Finally, the CFTC has been made aware of a significant problem by our colleagues in both Europe and Asia of a statutory requirement to indemnify the swap data repositories and the Commission as mandated under Section 728(d) of the Dodd-Frank Act. Many jurisdictions are not able to comply with this requirement and have demanded that change be made or they will not cooperate with the U.S. swaps data collection efforts. The staff has correctly pointed out in this Report that a statutory change may be necessary to ensure that the U.S. is able to fully cooperate with international regulators to share critical information regarding global risk exposure and trade data. In closing, I commend the staff for their hard work to deliver unprecedented international coordination on broad policy questions. However, our effort to harmonize our rules and to enable mutual recognition or accommodation remains incomplete in both words and actions.